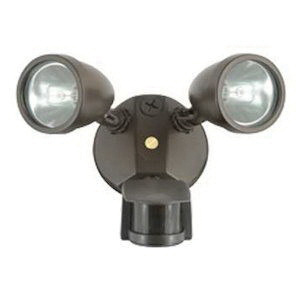 Hubbell Lighting Twin-head decorative motion sensor kit contains motion sensor, two 75-Watt G8 quartz halogen floodlights, decorative heads and cover plate. The included weather-tight motion sensor with multiple controls, has a 130-degree detection zone and performs reliably in all weather conditions. The 150-Watt attractive security floodlight set uses two powerful 75-Watt G8 quartz halogen lamps to provide superior lighting performance. The included decorative heads feature die-cast aluminum construction. The cover plate is made using cast aluminum and supports use on 4-Inch junction box. Kit is cULus listed.